This ended up working better than I hoped. Below Talheim station are several hidden staging tracks, and there is not a lot of headroom. I spent some time coming up with a way to get Tortoise slow motion underfloor switch machines mounted in the little space I have, but those things are not made for situations where space is tight. 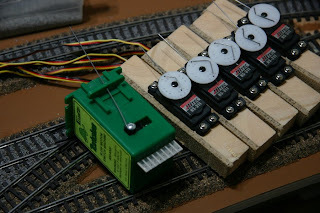 Finally, I read Craig Bisgeier's Housatonic Railroad Construction Journal and about his very positive experience with Servo controllers from Tam Valley Depot. These controllers use regular RC model servos, are relatively cheap, and particularly the QuadP, dead-simple to program. Like the Digitrax DS64 and the Team Digital SRC16 they can be controlled with momentary push-button switches from a control table and can be combined with LEDs to provide visual feedback of switch positions. Unfortunately, the QuadP doesn't have Loconet, so it's unable to report switch positions back to a computer. That's a bummer. 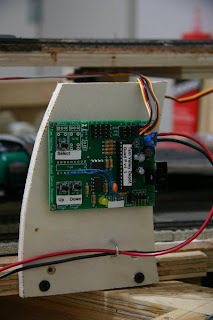 But looking around there doesn't appear the be an manufacturer that makes a stationary decoder that combines the ability to control RC servos with Loconet feedback and control. A bit odd. There are several others that are coming close to the TVD QuadP in options, like the Team Digital SMC4, the ESU Switchpilot Servo (though, after my less than stellar experience with the regular Switchpilots, I'm not going to buy any more Switchpilots), or the Uhlenbrock 67800, but they are either hard to get in the US, or cost quite a bit more. So far (1 week), I'm happy with the QuadP. It doesn't come with a case, so one needs to be a little bit careful with where you place it, but I can live with that.